Robert Smith, Gravity project development, organizes letters for the signage of the Gravity Coffee stand that opened this week in Federal Way. 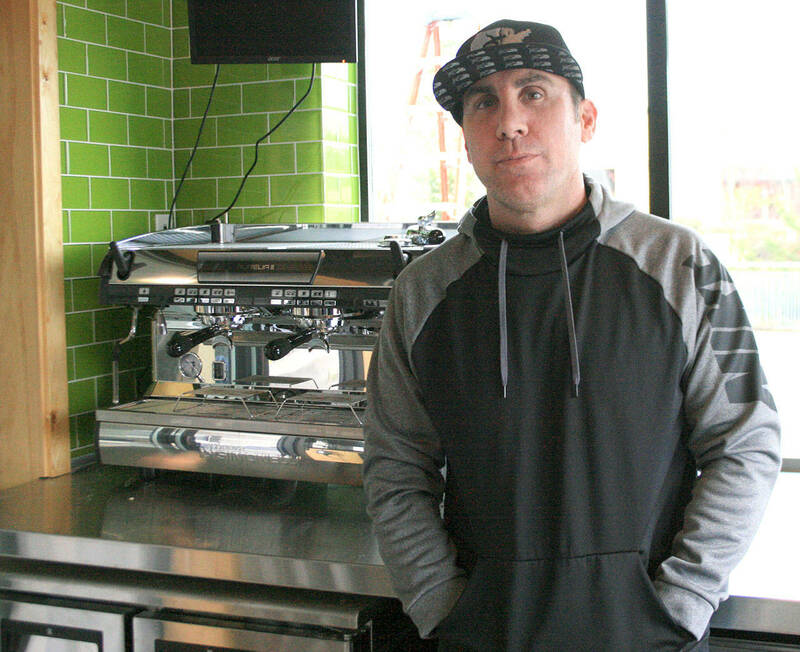 It is the first of three stands Gravity Coffee owner intends on opening in Federal Way. Jessica Keller, the Mirror. With the first of three coffee stands now open in Federal Way, Max Ansola, founder of Gravity Coffee, hopes to continue the success of his chain in his former home town. While the official grand opening isn’t until the weekend of April 6 through April 9, Ansola successfully launched his soft opening this week. The Gravity Coffee stand, at 35007 Enchanted Parkway S. in the Crossings shopping complex across from LA Fitness, is Ansola’s first in Federal Way but his fourth altogether. Construction on his second Federal Way Gravity Coffee stand is currently underway at 33370 Pacific Highway S., on the corner of Pacific Highway South and 336th Street. Ansola said that will be open within three to four months. He also has plans for a third location and has offers on three different sites in the Twin Lakes/Hoyt Road area, but no papers have been signed yet. Ansola said he is also considering a fourth location on 320th near the Commons Mall. Although a Federal Way High School graduate, a more practical factor prompted Ansola to take his successful coffee stands to the city: the market. The company is originally based out of Sumner, and has locations in Tacoma/Fircrest, Puyallup and Orting. Stands will also be opening soon in Maple Valley and Lakewood. Ansola said he has offers on 15 different locations in the Puget Sound, as well. His overall goal is to open 80 to 100 Gravity Coffee locations in Washington, and in late 2017 begin franchising them, but that will be mostly out of state, he said. While he has a successful coffee stand business, Ansola did not start there. His entrepreneurial career actually started when he opened his first tanning salon in Federal Way, Desert Sun, which grew into a chain. He started to franchise those businesses in 2008 and eventually turned his attention to coffee. “There’s a lot bigger demand and market in coffee than there is tanning,” Ansola said. Ansola said Gravity Coffee’s main competition is Starbucks, but that hasn’t stopped him from opening stands nearby. “I think being next to Starbucks is more of an asset than a liability,” he said, adding Gravity Coffee gets a lot of its customers from Starbucks because they don’t want to wait in long lines. He said the goal at Gravity Coffee is to have a wait time of two and a half minutes at most. Instead, Ansola said, he tries on making Gravity Coffee stand out. He said a big difference between the Gravity Coffee stands and others are how nice they are. Unlike other coffee stands, his have doors on them so employees can go outside and greet their customers and take orders and payments. Orders are typed into Microsoft Surface Pad tablets, with the information relayed back to a computer screen where the baristas are filling orders. “It speeds up on our drink orders,” Ansola said. The insides of the coffee stands are more spacious then others and feature top-of-the-line equipment. A stereo system also plays music both in and outside, as well. “It kind of sets the vibe with us and our employees and makes us a more fun and energetic atmosphere,” Ansola said. He said Gravity Coffee stands are built with employees in mind. “I think it’s really important to give the employees a nice place to work,” he said. Ansola said a great deal of time and thought went into what Gravity Coffee serves, as well. The company spent months coming up with a coffee blend it serves, but coffee makes up only 60 percent of the company’s sales, Ansola said. The rest comes from energy drinks, food, Italian sodas and smoothies. Like the coffee blend, Ansola said, Gravity Coffee has a proprietary energy drink, Zero Gravity, that has a number of different flavors. Ansola, a father to a boy and twin girls, said he also tries to have Gravity Coffee cater to children, with specialized cups and drinks appealing to them. They even make their own whipped cream and add flavors for children. “We make sure to do lots of extra stuff for kids,” Ansola said. Gravity Coffee even offers dog treats to customers with canines in their vehicles. To mark the grand opening of Gravity Coffee in Federal Way, customers will receive free drinks. The company is, however, accepting donations during that time for the ALS Association. Ansola said his father passed away from Lou Gehrig’s disease, and it was a hard time for him. Gravity Coffee is open from 4:30 a.m. to 8 p.m. Monday through Friday at from 5:30 a.m. to 8 p.m. Saturday and Sundays.